Owned and operated by Liz Squillace, Paradox Ink is devoted to promoting positive change in the environment by bringing art to public places. Liz received a BFA from the Rhode Island School of Design in 1999 and has been drawing, painting and screen printing ever since. 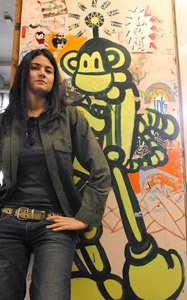 Her work bridges the gap between gallery art and street art making it accessible to everyone. Public art brings fine art and creative illusion to the street, whereas her screenprints bring imagery such as powerlines and industrial landscapes to gallery walls. Liz's public art can be seen in White Plains, NY, Stamford, CT and Bridgeport, CT where Liz currently resides. She is also a member of the Loft Artist Association (LAA) in Stamford, CT.